I was reading a post on a garden forum back in July. 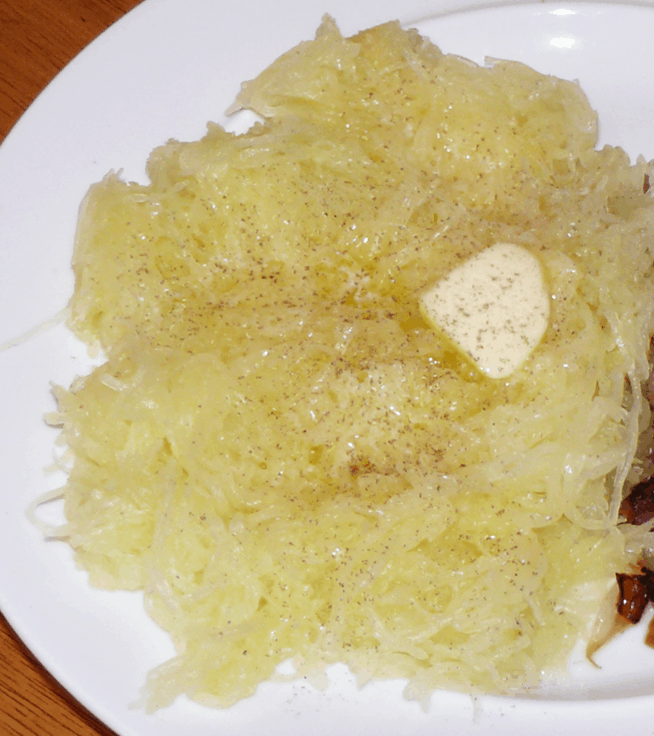 The lady had evidently tasted fresh spaghetti squash — straight from the garden — and had fallen in love with it. ( I relate to that.) She was all ready to “stagger the plantings” and wanted to eat spaghetti squash every other day when harvesting AND have some for winter storage. I couldn’t help but laugh. I have the same wish but it’s not gonna happen. Her staggered plantings in all probability would be no more than a day or so apart at harvest, not to mention the fact that I’ll bet she would need at least an acre of field to get that many squash. They sprawl and take lots of room. And as far as production per plant the usual is 2 to 6 squash depending on conditions. 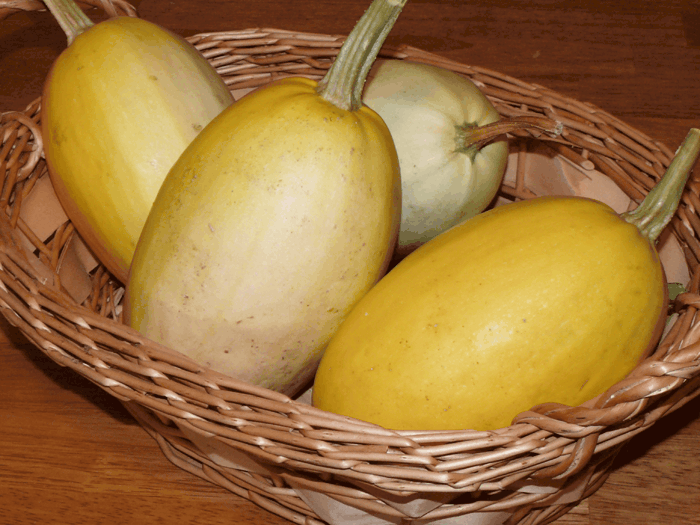 Although they are a warm weather crop they are called Winter Squash. According to what you read, fall is considered the peak season. I think the explanation for that, first and foremost, is marketing. Secondly, they are harvested in the summer and probably kept until fall. They show up in super markets at the time people have come to think of them as being “in season”. 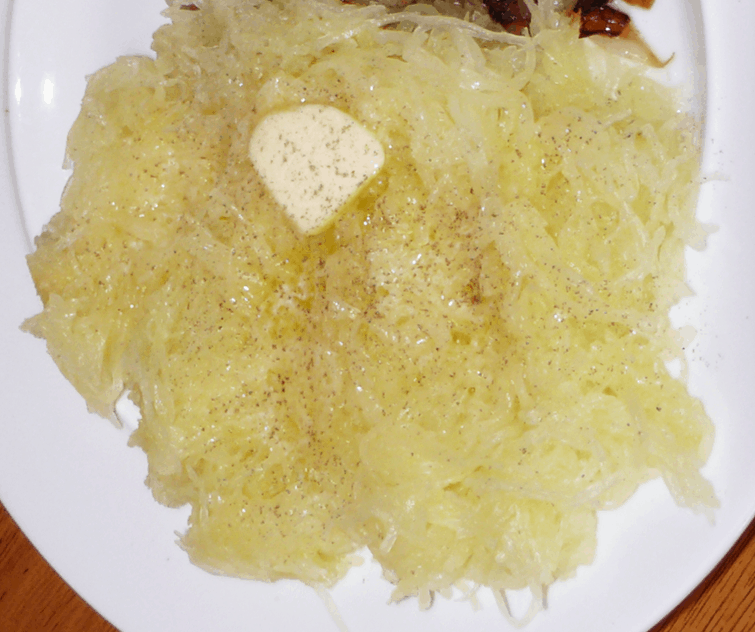 In my opinion Spaghetti squash are at their peak flavor when they come out of garden. The longer they are stored the drier they become—–not that they’re not good—–but rather they are at their best when they’ve been recently harvested. The recipes with sauces, cheeses, etc. 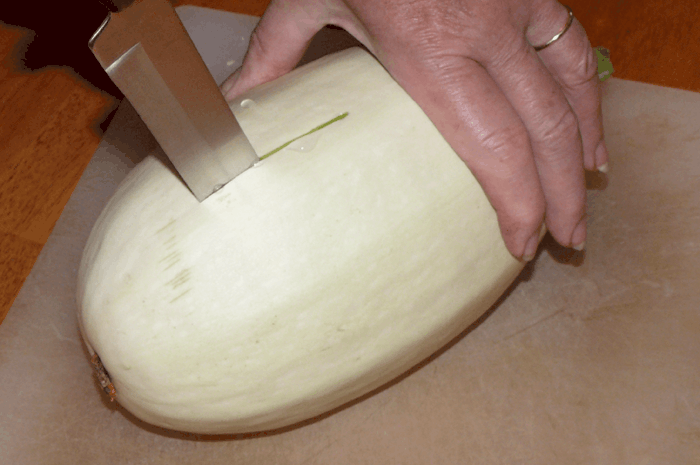 are fine for an older store-bought squash. The flavor of the just (or recently) harvested squash is delicate and a little butter and salt and pepper compliment it gourmet style. If you want to get a bit fancier but keep that delicate flavor, sprinkle the roasted seeds of the squash on top. Or use toasted almond slivers and buttered whole-wheat bread crumbs. I didn’t have room in my garden for these delights so I planted them at various places in my borders this year where they can sprawl through my daylilies and other perennials. I picked the very first one when it was 8 inches long because I was so anxious to enjoy one. I’m trying to use a bit of discipline in harvesting the others and let them grow as big as they will — up to 12 inches. One of these squash would serve 4 – 6 people if you are using it as a vegetable. Bill and I enjoy it as the main meal so one squash for us equals one meal. If you’ve never had one fresh from the garden you are missing something wonderful. Why don’t you make a note to try them next year. Here’s how I prepare mine. 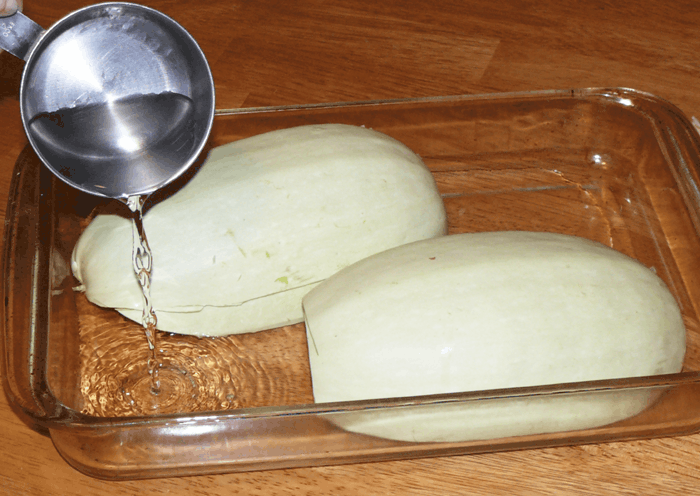 Clean off any dirt that may be on the squash. 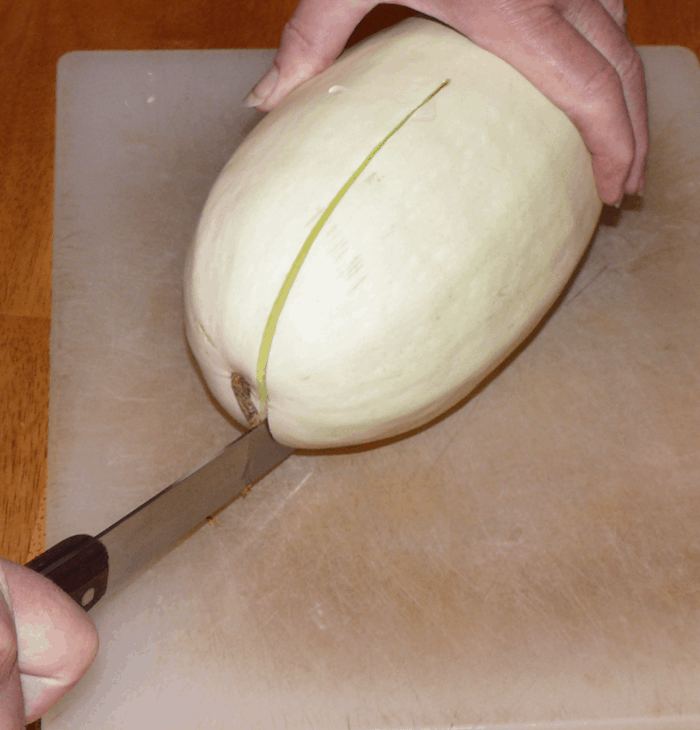 Cut the squash in half lengthwise so the strands will come out long. 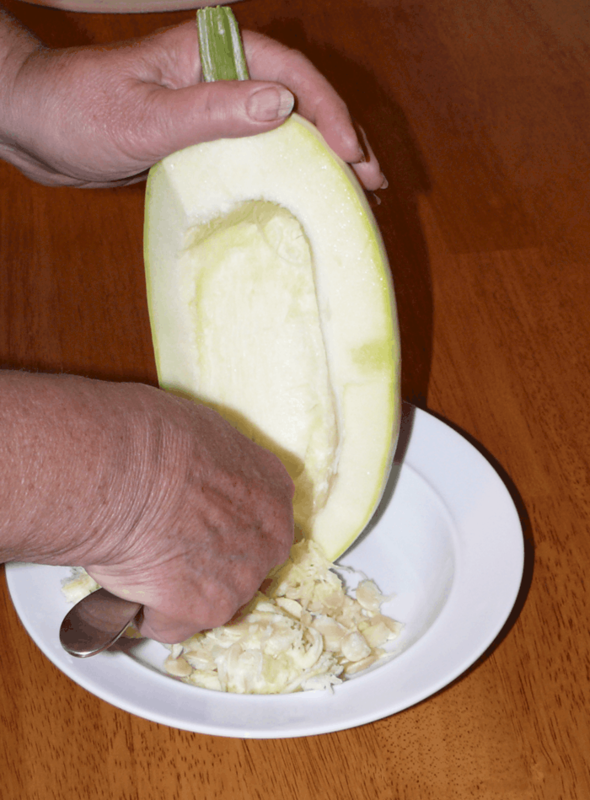 Remove seeds and pulp with spoon. Coat flesh lightly with olive oil. Place in baking dish skin side up with 1 cup of water. Cook 375 40 minutes to 1 hour until tender. Allow to cool about 15 minutes so you can handle squash. After I scoop out the flesh I put mine in a suitable baking dish. Cover with foil and return to the oven to stay hot until I finish cooking the rest of my meal. It is high in Vitamin A and C, iron and riboflavin. 4 oz has 37 calories. 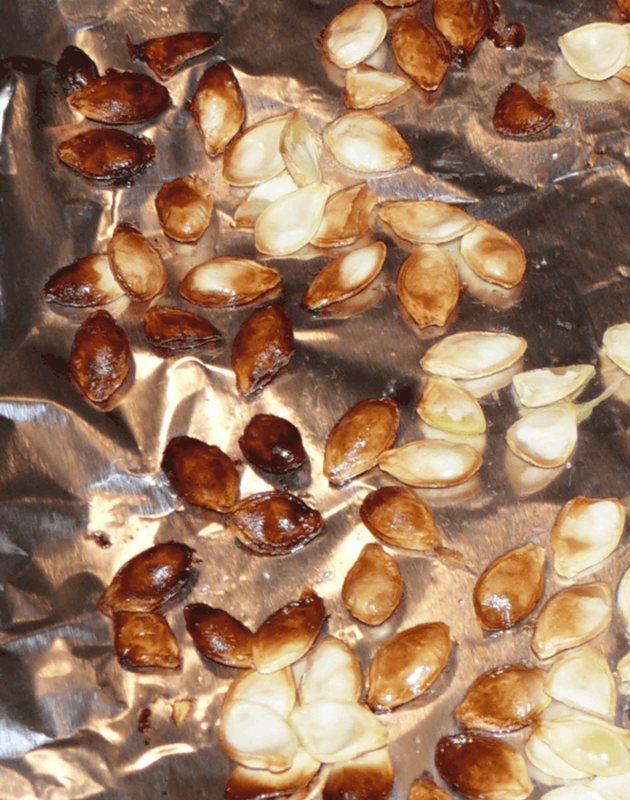 SEEDS can be cooked just like pumpkin seeds. Toss in olive oil and sprinkle with salt. Roast 325 degrees F about 25 to 35 minutes on foil lined cookie sheet. Serve on top of squash or let cool and store in an air-tight container. The squash below were harvested mid-July. They didn’t get as big as usual — probably because of severe drought conditions. You see the difference in color from the first one shown. This is normal though. I was afraid their taste wouldn’t be quite as delicate as the first one harvested ——but it was great. That sounds so good. I haven’t had one in years. I’m heading to the Farmers Market tomorrow morning. 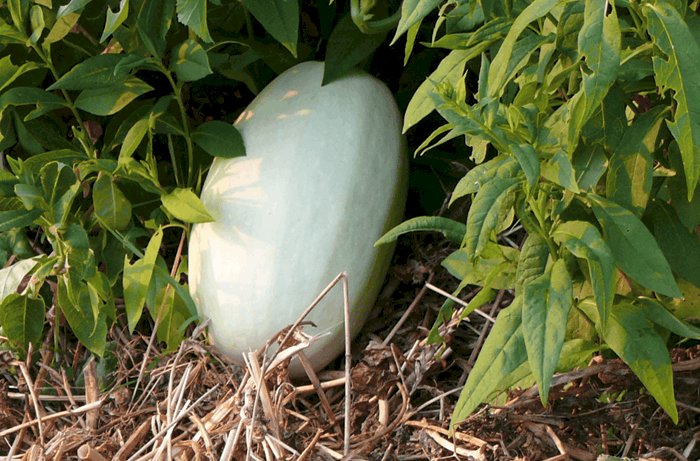 Hope you’ll find just the right spaghetti squash! Let me know “the rest of the story”. My taste buds are working overtime. No doubt about it Pea, when it’s fresh from the garden it’s melt in your mouth delicious! And by the way, welcome to TMG!